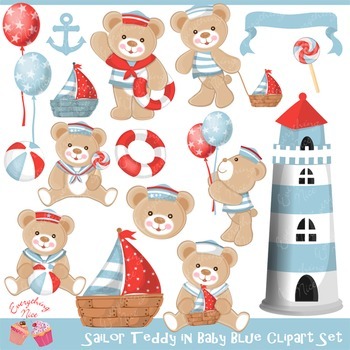 Sailor Teddy (Baby Blue) Clip Art Set perfect for all kinds of creative projects! Approx. Size of each Digital File is 8"
* Party supplies such as cupcake toppers, banners, wrappers, tags, etc. either in printed or digital format. Do not sell as is. * Cards, Invitations, labels, etc. either in digital or printed format. Do not sell as is. * Logos (DO NOT use as is). * Website or blog templates, banners, avatars, etc. No additional license for commercial use, but If you choose to use my clipart commercially, please give credit and link back to my TPT shop . ** Purchasing our cliparts does not transfer ownership of copyright. Everything Nice – Precious C retains all rights. Copyright © Everything Nice – Precious C. All Rights Reserved.